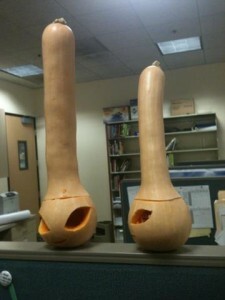 these are two of the three butternut squash grown from seeds. I thought I would get in the Halloween spirit by carving jack-o-lanterns aliens. First response I get from boss man is "you cannot have these displayed out in the public area. They're too phallic"
He is obviously not a Saturday Night Live fan and could not see the Conehead resemblance. But it does indicate what he tends to see, which could raise an awkward discussion at the next staff meeting.